I didn’t have the opportunity to learn much about the family of my mother, Edith Doane Kersenbrock, because she died when I was 10. And at 10, I wasn’t much interested in family trees. My mother’s mother had also died very young, and I didn’t have anyone around to ask when I did get to the point of being interested. As a young child growing up, I spent quite a bit of time with my cousins in Wilber, Doug and Dee Doane, children of Leslie (Leck) and Genevieve Doane. But they moved to Omaha about the time Mother died, and initially separated by distance, we were not close again until years later. My Mother’s only other living brother, George Doane, a West Point graduate lived in Indianapolis. He died in the 1970’s. However, when I was visiting in Nebraska in the mid ‘60’s, I read in the Crete News about a Doane Family Reunion being held at Doane College. I contacted the college about my connection with the Doanes and signed up for the reunion. I knew only that my grandfather was Justin Reginald Doane who was at one time Sheriff of Saline County, and his father’s name was James Coggswell Doane. When we were children we spent much time with my mother’s and Uncle Leck’s guardians, Uncle Frank and Aunt Lottie McElroy who lived in Wilber, Nebraska. When Grandmother Elizabeth Harvey Doane died (mother was 2 years old and one of 5 children), I understand that Grandpa Justin Doane “went walkabout”, his grief and pain too much to bear. Aunt Lottie was Grandmother Doane’s sister, both were daughters of Charles and Mary Morrison Harvey of Wilber. Aunt Lottie and Uncle Frank had lost a baby, so my “baby” mother and her two next oldest siblings, Elmer and Leslie, “became” their own. Uncle Frank had a barber shop and played in a band. I believe that the first Doanes I met at that 1960’s Doane reunion in Crete were brothers Bob and Charlie Doane and their wives Darlene and Marian from Essex, Connecticut. (Charlie and Marian are the parents of Jane Doane Anderson.) They had the “Doane book” of genealogy and found for me James Coggswell Doane who had left Essex with his wife Marilla Johnson Doane to come to Nebraska as pioneers. It was exciting to find that connection to my mother’s family, both in person and in the book. When I returned to the east, I had the chance to become better acquainted with these and more Doane and Doan “cousins”, including some in Massachusetts, and others in Bucks County, Pennsylvania. The greatest unraveling of my mother’s Saline County Doane relatives came from the Doane, Holcombe, Henke book written by Mary Alice Henke, copyrighted 1983. On page 32 was a picture of James Coggswell Doane and much information about his life. I shall use this book as my main source of information about Doanes to whom I am quite closely related but never met. James Coggswell Doane was born July 13, 1848, in Essex, Connecticut, one of eight children of Abbie Pardee and George Edward Doane. George Edward picture) was born in 1807, the son of Justus Doane and Phillipa Read; the names of these people are found in Volume 1 of the Doane genealogy book on page 202. On January 20, 1869, James Coggswell Doane married Marilla Ezrina Johnson in Essex, CT. In February, 1870, James and Marilla moved to Weeping Water, Cass County, NE, where my grandfather, Justin Reginald Doane was born April 30th. The family moved from Weeping Water in October 1870, to what would become Western, NE, in Saline County. “Before coming west, James was a mechanic and worked on ships in the boatyards in CT. In Western, he homesteaded, operating a blacksmith shop on the prairie east of town. When the post office was opened at Western in 1871, he moved his business into town, occupying a shop built of sod.” From an article I had about the cultivator James Coggswell Doane invented, Sasha found this engineer’s drawing and description from the United States Patent Office. “James took an active interest in politics and represented South Fork Precinct on the Board of Supervisors when the county was under township organization in 1884-1885.
mother Marilla Ezrina Johnson Doane (1849-1943). As I said earlier, my grandfather, Justin Reginald Doane was born in 1870 at Weeping Water, shortly after his parents moved to Nebraska. He received his education in Western and studied for one year at the Union District School. He assisted with farming near Western for a few years, and then moved to Wilber, NE where he was Deputy Sheriff of Saline Co. from 1894 to 1897. He was elected Sheriff in 1898. 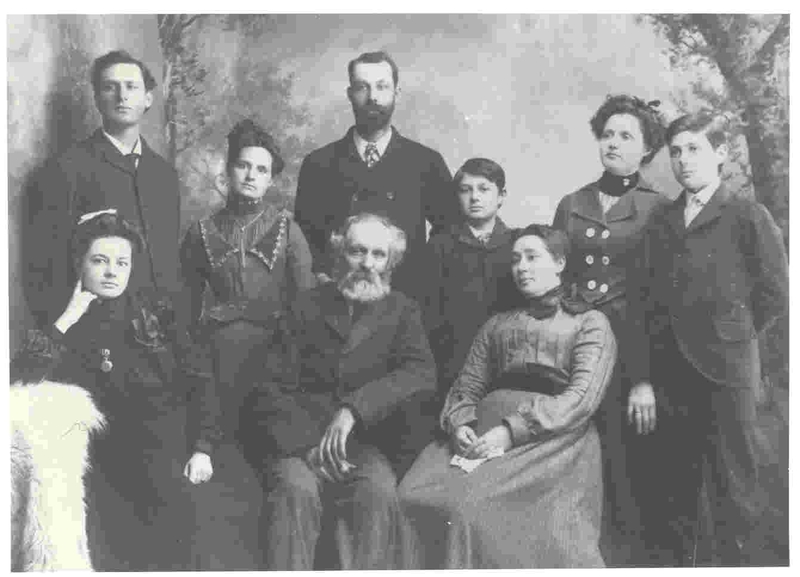 Justin Doane was united in marriage to Elizabeth Jane Harvey of Wilber on December 28, 1898. They had five children, Mabel Elizabeth Doane (1899-1934) George Harvey Doane (1902-1975), Reginald Elmer Doane (1904-1922), Leslie Stannard Doane (1908-1992), and Edith Jeanne Doane (1912-1948). In 1912 the family moved to a farm near Canton, KS, returning to Nebraska the following year. Elizabeth Doane died of a ruptured appendix in July, 1914, and Justine was not able to keep the five children, ranging in age from 2 to 14 years, together. Mabel and George, the two oldest went to York, NE, to live with James Bascom Harvey, Eizabeth Harvey’s brother (who earlier was captain of the University of Nebraska football team). I never knew Mother’s older sister Mabel Doane McMath, a nurse who died of tuberculosis and is buried in the Hope, Arkansas, cemetery, but when I was in the hospital as a child, her husband Sam McMath sent me a fine silver mesh purse. I was particularly fond of Uncle George and his wife Aunt Violet Doane, and when mother died, they later told me that they had wanted to adopt me. Uncle Leck and his family moved to Omaha about the same time Mother died, and I didn’t see much of them until I went to the university in Omaha. At that time I became quite close with my cousin Dee and her young family. Doug and I are only 2 weeks apart in age, so when the family lived in Wilber, we were great pals. We attended each other’s birthday parties, and on summer weekends we all gathered at Aunt Lottie and Uncle Frank’s for a picnic which included homemade apricot sherbet…the recipe calls for a quart of heavy cream. After graduation, Uncle “Leck” Leslie Doane lived and worked in Wilber, married to Genevieve Sims Stetson, with children Delores “Dee” and Douglas Doane. For 3½ years he served as Registrar of Deeds, and as Clerk of the District Court for 4 years. Les was a musician through high school, and later had a dance band, Les Doane’s Hungry Six Brass Band, specializing in Bohemian and German polkas and waltzes. After moving to Omaha where he lived for 18 years, he worked in sales and as an FHA appraiser. My mother, Edith Jeanne Doane graduated from Wilber High School and studied voice with Dr. George Aller at Doane College. She taught country school for a year, and for three years was bookkeeper in Wilber city offices. Edith was an accomplished vocalist; she sang for various occasions, including as a soprano soloist with the Cretonians, a male glee club directed by Dr.Aller. George Kersenbrock sang with this group, and this is how Edith and George met. George graduated from Doane in 1933, and the couple were married in 1934. Edith and George had three children, Janice, born in 1935, Joan or Jody, born in 1937, and Paul born just before the war in 1941. For the first dozen years of their marriage, George and Edith lived in the large house in which George grew up, with George’s mother living with them. The only heat in the upstairs came from the chimney column that came up from the wood cookstove in the kitchen, and the floor registers. We slept under feather comforters and changed clothes downstairs during the cold of the year. On an icy January day in 1948, Edith’s car was carried onto the tracks of the main line of the Burlington Railroad which crossed Main Street in Crete. The barriers across Main Street at that intersection which exist now are as a result of the crash that ended her life that day. My sister Janice had just celebrated her 13th birthday, I was 10½ , and Paul was 6½ years old. Janice attended Doane for one year and then went into nurse’s training at Lincoln General Hospital. She received her Bachelor of Science Degree from Nebraska Wesleyan and taught nursing. She now lives in Fair Oaks, CA, with her husband of over 50 years, Bob Stone. Their one daughter Julie lives with her husband Wayne Eberly, a Presbyterian minister, and family of four children in Houston, TX. My sister and her husband have spent much of their time over the years with their grandchildren. My brother Paul Kersenbrock, like my father, was tall; he was a star on his high school and college basketball teams. Paul married his Doane College sweetheart, Echo Platts, and they raised three daughters, Kim, Suzy and Cindy. Paul received a Masters Degree in deaf education and taught at the Indiana School for the Deaf in Indianapolis before returning to Crete. In Nebraska he worked in construction materials sales, was a lay minister in the Methodist church, announced Doane basketball games, and wrote a book on brewing beer, a favored hobby. Paul died of a massive coronary at the very young age of 45, 24 years ago this month. My niece and Paul and Echo’s daughter, Kim Kersenbrock, Doane alumnae, married Rex Mueller; they have a Doane college-bound son, Ryan, and a daughter Leslie a junior in high school. They live in Omaha where Kim is an art therapist in the Omaha Public Schools. She is also adjunct faculty here at Doane, teaching an introductory class in Art Therapy. Niece Suzy Kersenbrock Cochnar, Doane alumnae, married her high school sweetheart, Jack Cochnar. Suzy taught art in middle school in Lincoln before coming to work in Admissions at Doane. She and Jack have four youngsters: Michael, a 2010 Doane graduate; Valerie, a Doane freshman, Alyssa a sophomore in high school and 9 year old Nathan. Suzy and Jack own the TaeKwanDo studio in Crete. Niece Cindy Kersenbrock Bicker, alum of Bethany College in Kansas, is also an artist. (The girls inherited this talent from their mother, Echo Platts Kersenbrock Easton, also adjunct faculty at Doane.) Cindy is married to Micah Bicker, and they have 3 youngsters, 14 year old Elliot, 11 year old Naomi and 7 year old Clara. Cindy teaches art in Hiawatha, KS, schools. I’m the last of “My Saline County Doanes” about whom to write. I took after mother and studied voice, earning my living as a free lance musician for a dozen years in New York and Munich, Germany. I lived away from Crete 44 years, in college and graduate school, then singing, teaching, working for an advertising agency, and later marrying. My first husband, Don Sabath, was an artist affiliated with the Pennsylvania Academy of the Fine Arts in Philadelphia; I inherited two stepchildren when I married him. Don died and a few years later I married another widower, Harold Hofreiter, and inherited another six stepchildren. The children of my stepkids are my grandchildren, and I stay in close contact with all of them. I have lost two stepsons to massive coronaries and a stepdaughter to cancer. Here in Crete, I am a Worship Leader at Trinity Memorial Episcopal Church which my grandmother Doane attended as a child of Mary and Charles Harvey; and where my mother, Edith Doane Kersenbrock directed the choir for services. I am also active in politics and am involved with the Aging Coalition Advocacy Group for AARP Nebraska. On the website of Trinity Memorial, www.trinitymemcrete.org is more history about the church, on the National Register of Historic Places, written by Janet Jeffries and by me.